Surprises can be good for the soul. I knew that my hostelry in Santa Barbara would be of an acceptable standard – all the guides and references books had told me so. But, to be honest, they had done so without an excess of enthusiasm. 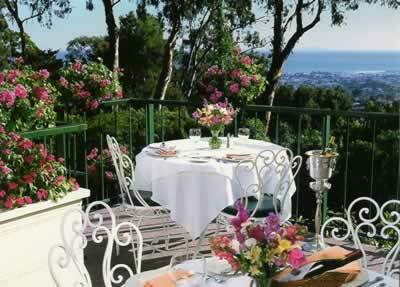 What a shock, then, to find that El Encanto is one of the most delightful hotels in California. To be sure, any property perched on a hill overlooking Santa Barbara (90 miles north of Los Angeles) has a good start. The view is loveliness itself. Not for nothing is this called ‘The American Riviera’. Those of you accustomed to the panoramas to be had on France’s Côte d’Azur will have an immediate sense of déjà vu, for that is what is laid out before you: blue water, sparkling in the sun and surrounded by hills of lush vegetation. The bay below, by a quirk of geography, faces south (instead of the usual west) and therefore has a most temperate climate. And – lest you think you have slipped from déjà vu into full-blown hallucination – yes, you are surrounded by Mediterranean flowers and shrubs. Apparently, back in the mists of time, an Italian gentleman arrived here with hundreds of plants from the Mediterranean in his luggage. And the rest, as they say, is horticulture. El Encanto means ‘The Enchanted’, and I needed no convincing of this property’s claim to the title as I wandered in its ten acres. Lovingly tended each day by a team of gardeners, these are some of the most impressive hotel gardens I have encountered. 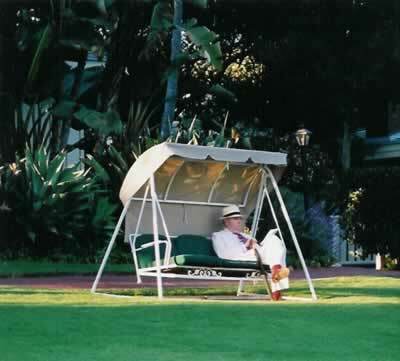 Each day of my stay – as my picture illustrates – it was my pleasure to pause for a while and sit in a shaded chair amidst this lush demi-paradise. There I would contemplate the pleasures to be had in this life, as I looked across the sloping lawns and away to the Pacific. Nor was my contentment confined to the public areas of the hotel, for I had my own private patio. Here, with the bright, primary colours of exotic birds in the branches above, and to the soothing sound of water dribbling from a stone lion’s head in the wall by my side, I dozed of a sunny afternoon and dreamt Presidential dreams. Why Presidential? Because I was in the Presidential Residence. I know – from my peepings around doors – that all the accommodations here are spacious and stylish. 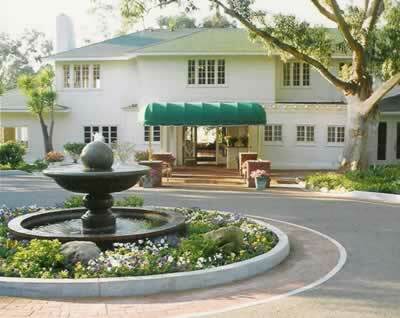 But – if the pennies are available – do try to reserve the Residence ($525-$925 a night for two, according to season). It occupies one of the Spanish style bungalows dotted around the grounds, and provides supremely comfortable living quarters. I took a photograph of its sitting room, but I have not included it because it fails to do any justice to this marvellous, airy chamber – which boasts four windows, a balcony, a working fireplace and views of the ocean. Its white walls and wood-block floor exude a sophisticated yet rustic elegance. I found its sofa and enormous easy chair (rather like a room in itself) provided yet more aids to relaxation. All was well-presented, for the housekeeping – like the rest of the service at the hotel – is of a high order. The genial General Manager, Nicholas Davaz, must be congratulated on the immaculate state of his establishment. Had I wanted, I could have cooked a meal in the kitchen. But I preferred to devote that modicum of energy I wished to expend to ensuring that the second fireplace – in the bedroom – was well prepared for a good blaze after dinner. For I find it truly blissful to drift into sleep to the sound of crackling logs. My only disappointment was that there was no bathtub for my pre-prandial ablutions. Still, thoroughly showered, I was able to comb my golden locks in the dressing room, before going to the walk-in wardrobe, in order to select my suit for dinner. I decided to pass over the pink seersucker (which had caused such delight to the affluent shoppers along Santa Barbara’s main State Street earlier in the day), and choose a white single-breasted two-piece with peaked lapels. I always take care over my dress for dinner. Here, I am pleased to report, my fellow diners did likewise. They must have been inspired by the prospect of what is a truly magical setting. With twinkling lights all around the bay, the view from the terrace restaurant after sunset is stunning. To the sound of crickets about their amorous night adventures in the gardens, I sat back in the wrought iron armchair, took the menu from my efficient waitress, Devaughn, and selected four courses ($66). Chef Mark Kropczynski sent to my table some enjoyable food. A salad of organic baby field greens, Stilton, pear, toasted pine nuts and balsamic vinaigrette was well-constructed. Sautéed foie gras was happily partnered with Fuji apple. Herb roasted rack of lamb with a garlic jus comprised tasty, properly cooked meat – although the presentation might have been sharper, if the meat had been de-boned and the quantities on the plate reduced. A large and satisfying ‘floating island’ concluded this happy meal. About 100 wines are featured on the wine list. Most are Californian (like 1998 Opus One at $205 and 2001 Far Niente chardonnay at $84), but there are some French champagnes (1993 Dom Perignon is $194) and a few other French bottles (like 2000 Louis Latour chablis at $42). Glasses are good (Spiegelau), and I found that waitress Devaughn knew her wines. She brought to me the ever-reliable, big and buttery Robert Mondavi Reserve chardonnay from the Napa, in its 2000 vintage ($48), and a wine new to me, Justification – a blend of two-thirds cabernet franc and one-third merlot – which at first threatened to be light and lean, but then opened up to yield lots of dark fruit and a lovely vegetal nose (Justin Paso Robles - $75). A stroll along a winding path and I was back at The Residence, to light the fire and prepare for bed by the light of its flames. I slipped away, knowing that the morning would bring the delights of breakfast. And delights they were – for there was the panorama once more, now with the sun lamp on. Shaded by striped awnings, my large round table on the restaurant terrace was just the spot for poached eggs, crispy bacon and pork sausage, washed down with a pot of coffee and some truly delicious fresh grapefruit juice. No sign, I am pleased to say, of a buffet. El Encanto, with its glorious gardens, its near-perfect setting, its lovely accommodation and its enjoyable eating and drinking is a place which will charm and delight you. Pretend you do not know how good it is – then you will have a super surprise. 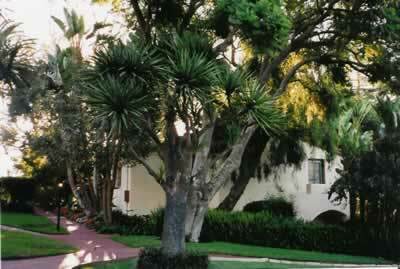 1900 Lasuen Road, Santa Barbara, California 93103, U.S.A.